He studied at the Department of Music and Drama at the State Conservatory in Prague. From 1978, he was a soloist at the operetta and musical ensemble of the J.K.Tyl Theatre in Plzeň, where he performed in many main roles (42). His cooperation with director Petr Novotný started here, and it continued also in his engagement at the Musical Theatre in Karlín. In 1991, he became a soloist at the Prague State Opera. A year later, he played the main character, Jean Valjean, in the Czechoslovak premiere of the Musical Les Misérables, and he also played Valjean in another Prague production from 2003 (until 2007). Since 1994, he has been a permanent guest at the opera of the Prague National Theatre and at the Prague State Opera. He performs as a guest on foreign concert and opera stages in Germany, Austria, Holland, Italy, Norway, France and Japan. He represented the Czech Republic at a celebratory concert to mark the 10th anniversary of the world premiere of the musical Les Misérables at London's Royal Albert Hall, as one of the 17 Jean Valjeans existing worldwide. He is a holder of the 1999 Thalia Award for the role of Fred in the musical Kiss Me Kate. 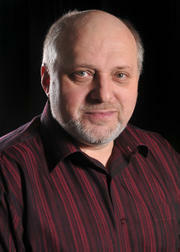 In the years 1999 - 2000, he was the head of operetta and musicals at the J.K. Tyl Theatre in Plzeň. In 2000, he founded the JAN Production s.r.o. agency and as a festival producer and director, re-launched the outdoor theatre in Loket near Karlovy Vary, which had been inactive for 40 years. Both international and Czech operas are produced there every year. In 2007, he was awarded a prize by the Musical Theatre Society in Prague for "The best operatic enterprise of the year" for the operation of this festival. He has returned for the third time to the role of Jean Valjean in the Brno production of Les Misérables.